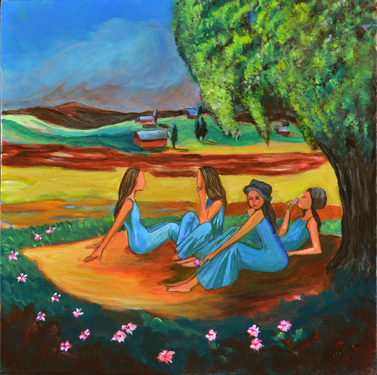 This is a companion piece to "Childhood", where four young girls share a moment of happiness under the shade of a tree. They've become young women, and this reunion is special because it doesn't happen often. This is about me and my sisters. Although our perceptions about our childhood and our personalities are extremely different, there's still a strong bond between us. My sisters are extremely important to me and one of my dreams is to grow old with them.